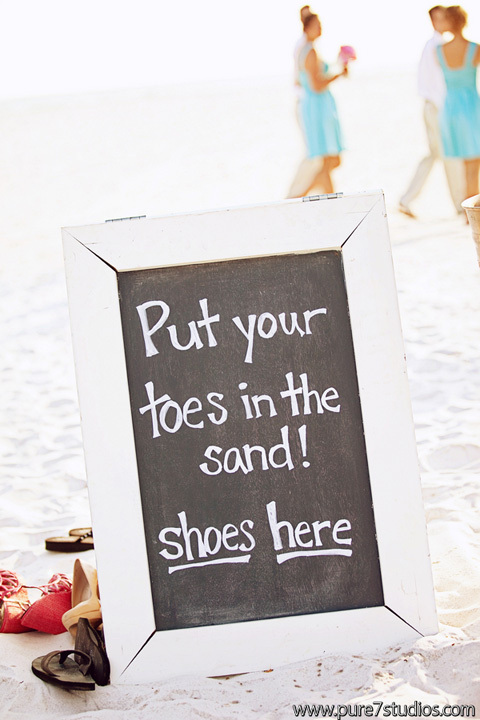 April 3, 2013	by B-Boy Productions, Inc.
Ah, the destination wedding … creating memories to last a lifetime in a location with unparalleled beauty and ambiance! 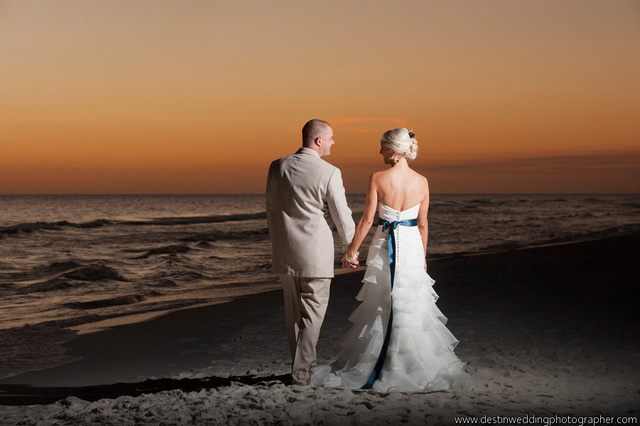 It’s no wonder that Destin, Florida consistently ranks at the top of the list for domestic wedding getaways – sugar sand beaches, emerald green waters (they don’t call it The Emerald Coast for nothing! ), warm gulf breezes and friendly natives. 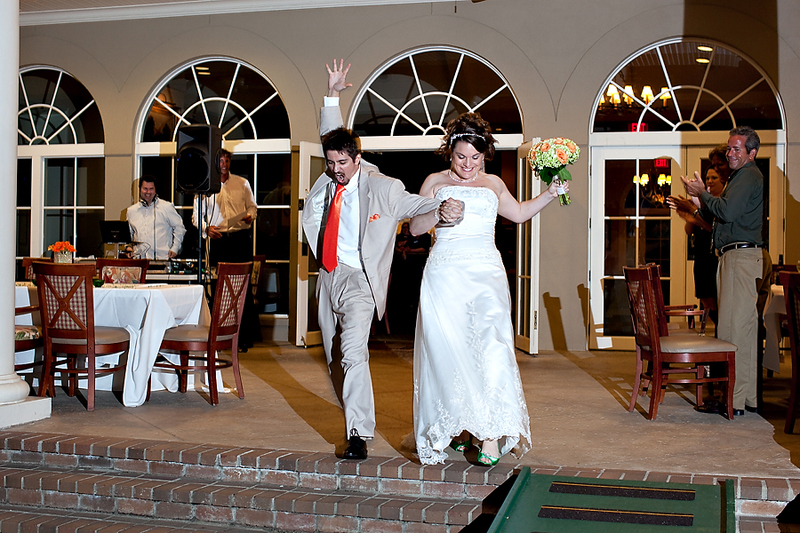 With a DJ and entertainment company division located in Destin – and with years of experience living and working in the local area – B-Boy Productions, Inc. has a unique perspective on recommending top wedding venues … we’ve worked at most of them! The list of recommended venues is extensive, so we’re going to just start with a select few and make this a multi-part series! This romantic bed and breakfast hotel is at the secluded end of a beachfront road, and offers spectacular views of the gulf; wedding ceremonies on the beach or West or East lawn; catered receptions on the lawn or the Veranda; and luxurious accommodations for wedding guests. Henderson Park Inn added a North Lawn across the street for larger guest counts as well as an adjacent parking area, which adds convenience for wedding guests not staying at the property (since parking is very limited at the Inn). *Note that Henderson Park Inn is an adults-only property for accommodations, but children are allowed to attend weddings/events. 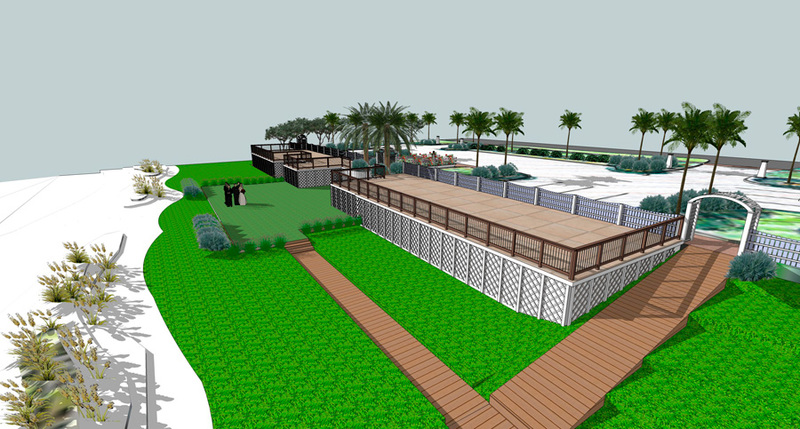 This open-air venue is owned/managed by the folks at Henderson Park Inn, and will be coming soon to the space right next door to the inn. 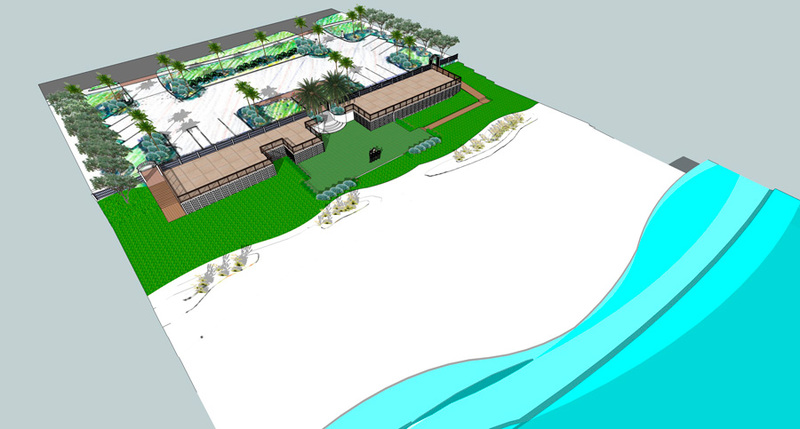 This 3-1 one venue will feature a stained concrete deck area, a lawn area, and a beachfront area – all with completely unobstructed views of the Gulf of Mexico. While still under construction, they do have a few artist renderings of the new space, and you can contact Christine Walker at 850.200.3614 for more information about advance booking. The park encompasses 161 acres in the midst of South Walton County in the Florida panhandle, along the shores of Tucker Bayou and the Choctawhatchee Bay. 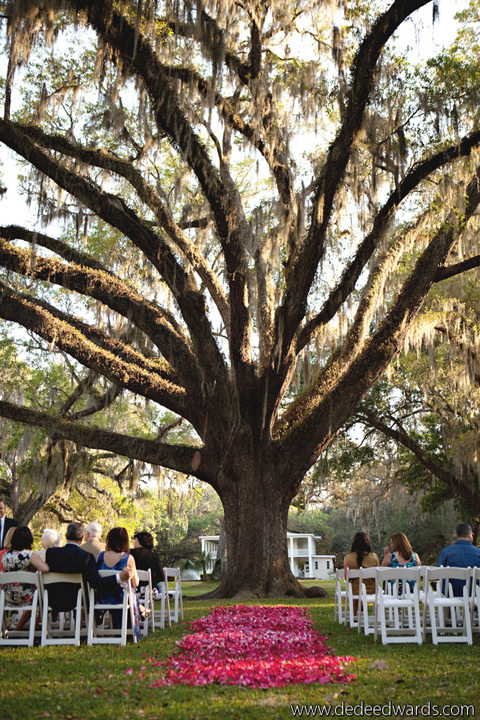 The site boasts numerous gardens; reflecting pools; towering moss-draped oaks; serene waterways; and the historic 110-year-old Wesley House. Eden Gardens State Park has a pavilion that provides an enclosed area for approximately 150 guests to sit and eat, plus a large food preparation room. 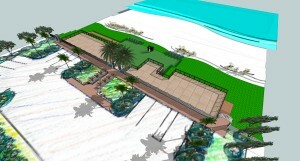 The park is available for rentals by contacting the Event Director at the park office. 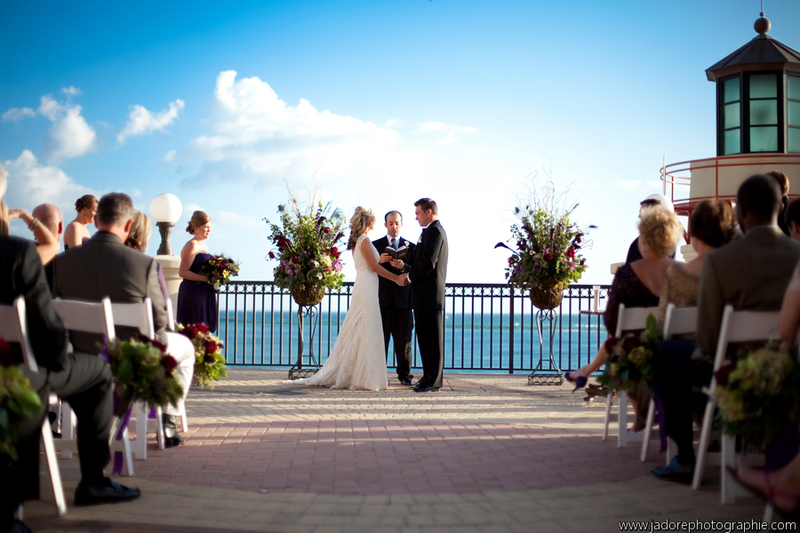 Overlooking the Gulf of Mexico, the Emerald Grande at HarborWalk Village offers a wide array of indoor and outdoor locations that provide the perfect backdrop for wedding ceremonies and receptions. For those not interested in sand between their toes during the ceremony, Emerald Grande includes a breathtaking outdoor deck with a grand staircase for creating an unforgettable entrance. On-staff event planners and culinary professionals make planning super easy, and special accommodation packages such as the Sweetheart Package and Honeymoon Package offer wedding parties great value. 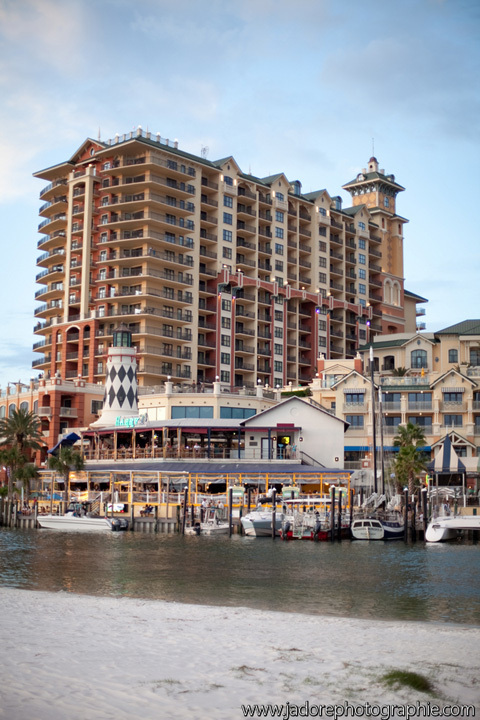 Consistently voted as one of the top Florida resorts – and currently ranked #26 on the Conde Nast Travelers Top U.S. 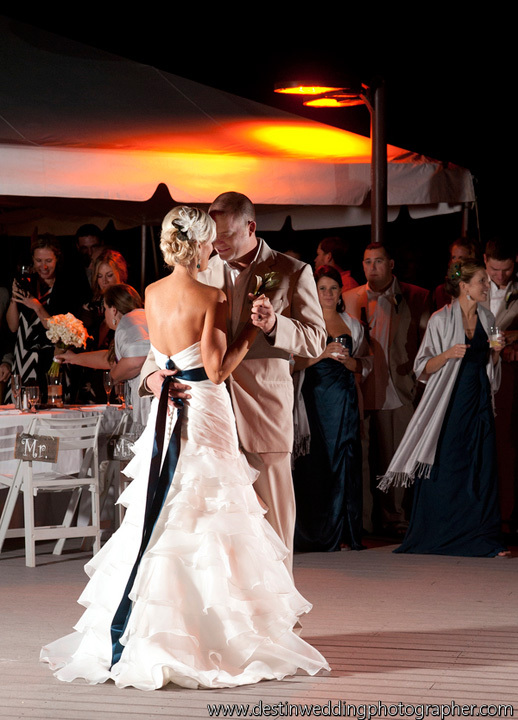 Resort Spas – this beachfront hotel offers all the amenities a bride and groom could dream of, plus 32,000+ square feet of flexible indoor and outdoor space to accommodate any dream wedding plan. 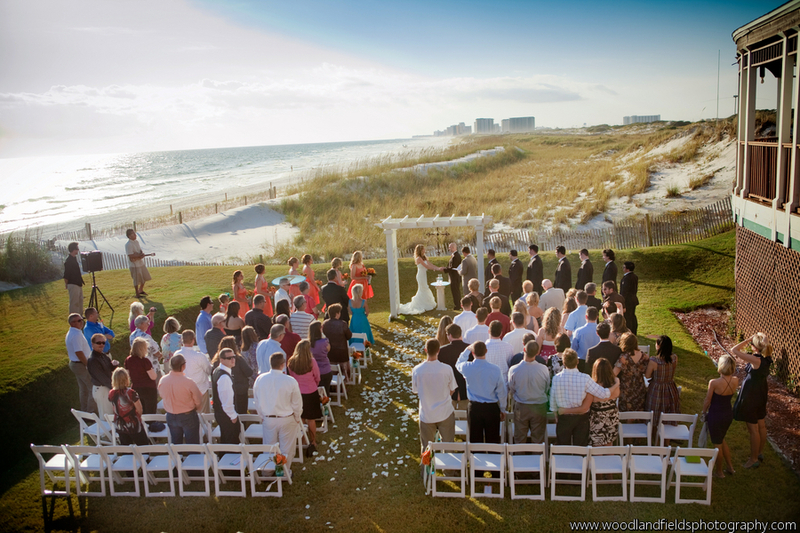 Beach weddings at the Sandestin Hilton are treated with an eye for detail that gets rave reviews from wedding parties and guests: a wedding arbor with fresh flower décor, a champagne toast for guests, tiki torches with greenery, a limousine for the bridal party, and more. We also love that security comes with the ceremony packages to ensure a somewhat private space is secured for your location without sunbathers strolling by or ending up in your pictures. One of the specialties of the Hilton is feeding guests with bountiful hors d’oeuvres and lavish dinner spreads, both for rehearsal dinners and receptions. And special touches for busy bridal parties can include Bride’s Dressing Room Refreshments and Groomsmen on the Go menus. 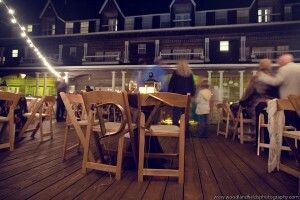 They offer cocktail hour/reception space on numerous outside decks or inside ballroom spaces during the hot and cold months. 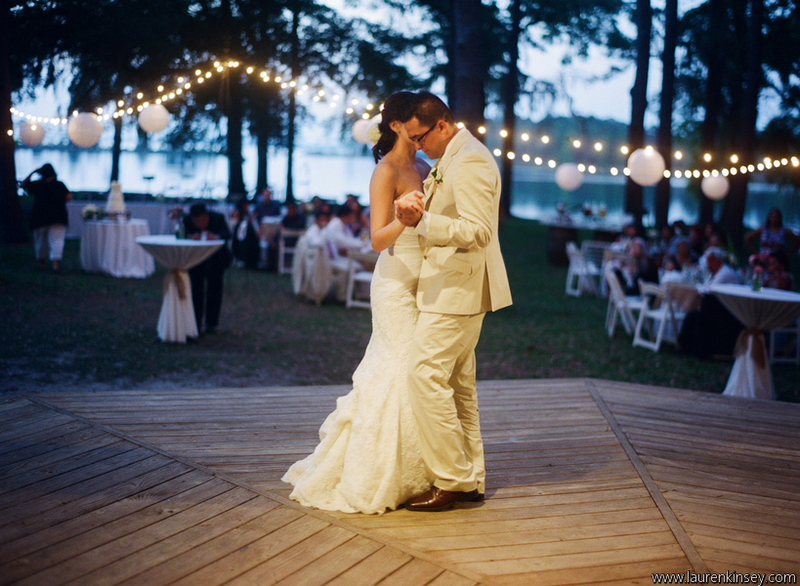 The indoor ballrooms act as a “day of” rain alternative which can be quite the cost/location saver, eliminating the need for tents or switching venues at the last minute. This private beach club is set among the rolling dunes of WaterSound Beach, with sweeping views of the Gulf of Mexico and private boardwalk access to an exclusive beach. There are multiple options for ceremonies and receptions at WaterSound Beach Club, including poolside among the generous terraces and 14,000 square feet of pool decks surrounded by sprawling green lawns; or the grandeur of a the Shark Tooth Golf Club with it’s sophisticated art glass windows and chandeliers, fireplaces, and natural wood and stone interiors. 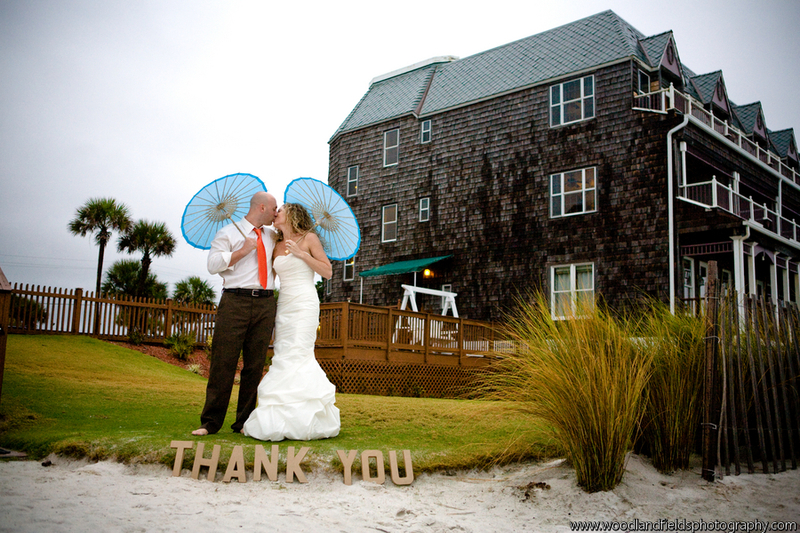 The wedding team at WaterSound prides themselves on their ability to personalize a wedding to each couple’s unique vision. 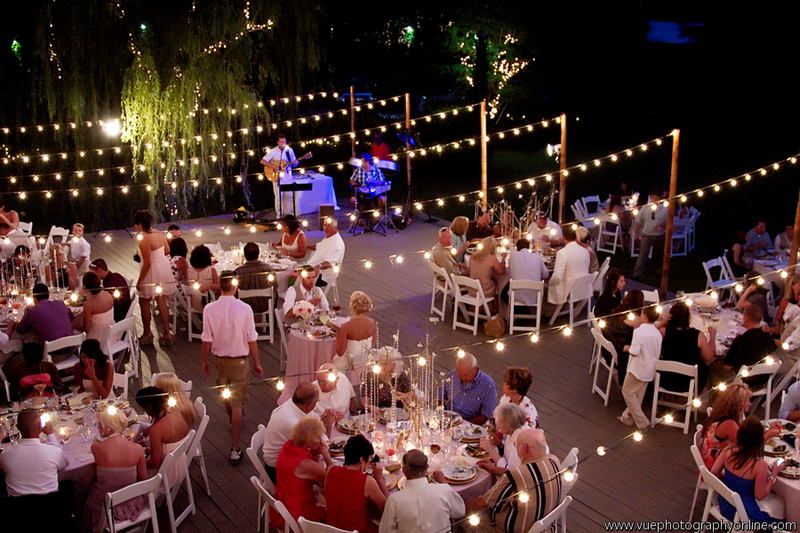 There are so many things to love about this venue! Location – Situated on the beautiful Choctawhatchee Bay in Santa Rosa Beach, conveniently located between Destin and Panama City Beach, and close to all of the little resort towns along the 30A corridor. Space – Bentley’s on the Bay can accommodate both large and small events. They offer over 3600 square feet of covered and open deck for bayside weddings and receptions of up to 200 guests. And indoor areas with amazing views and 2200 square feet of space. 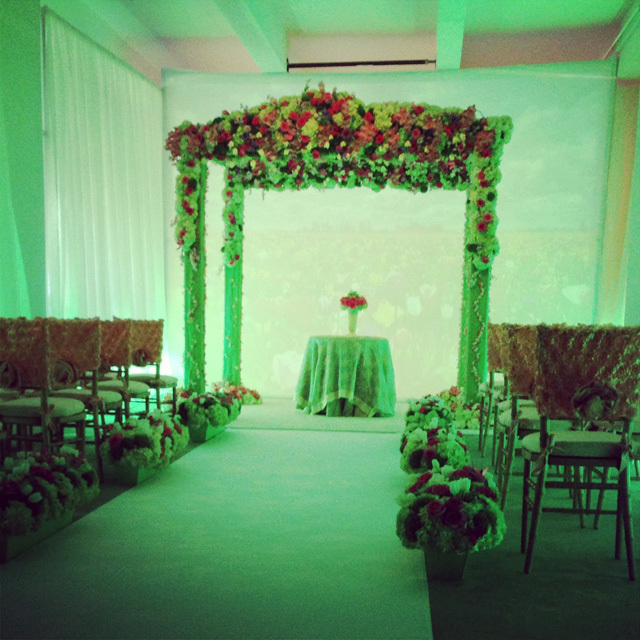 Privacy – Bentley’s only hosts one event per day, assuring that your wedding gets the attention it deserves. 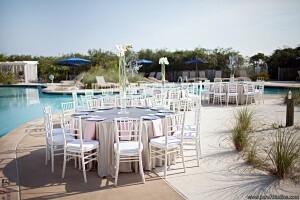 Resources – This venue offers a team of event professionals to assist in planning your event; day-of coordination services; and even rentals for tables, chairs and linens. 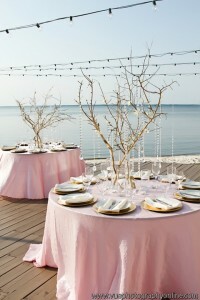 Food – Oh yes, a dedicated caterer and pastry chef. Fresh ingredients and artful presentation. Pick a destination that can fulfill your needs. 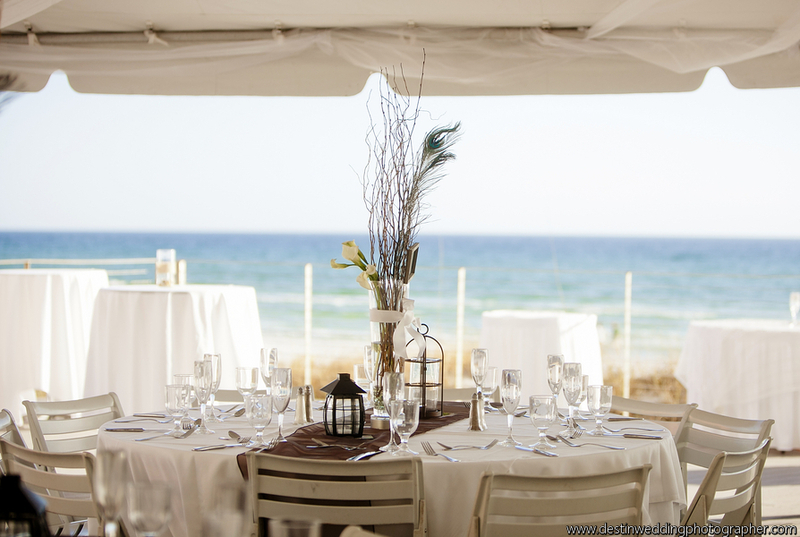 Think about your dream wedding and decide what best represents your vision – a wedding on the beach, overlooking the beach, underneath a gazebo for sun protection, etc. 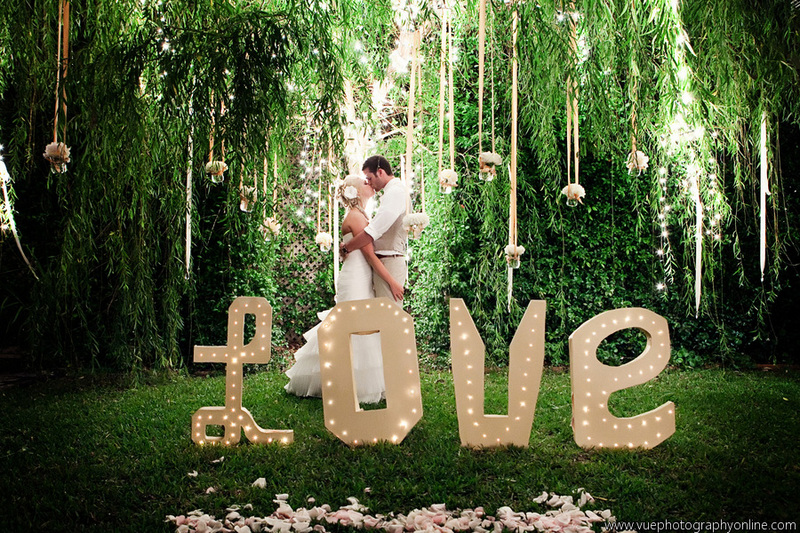 Send pictures of your ideal setup – from chairs to floral displays – to your wedding planner. It will help your planner to assure that the destination offers everything you’re looking for. 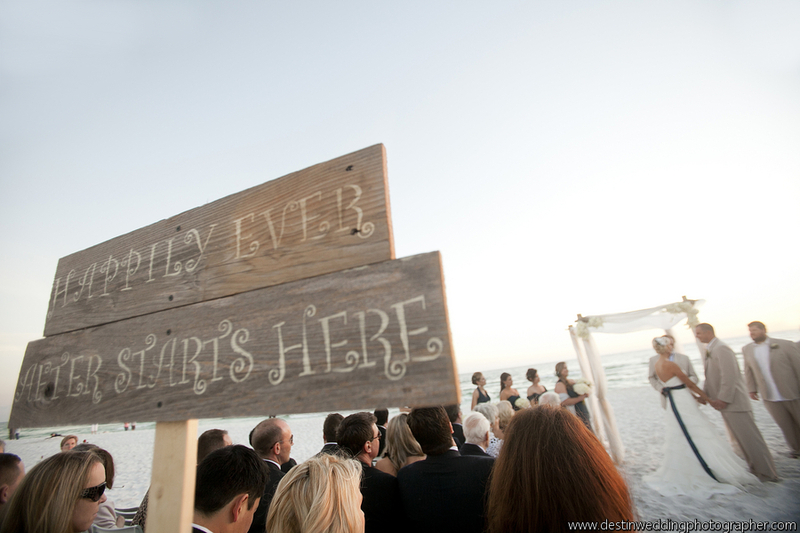 Watch for more Destin, Florida venue information in future posts! March 19, 2013	by B-Boy Productions, Inc. So when arguably the most renowned international event planner, Preston Bailey, calls and asks if you’d be available to work a high profile event at the Empire State Building, what do you do? You immediately go to your calendar praying to God you’re not already booked. Once you see you’re available, you get back on the line and say that you are absolutely available. This was literally how this event came about. What was this event? 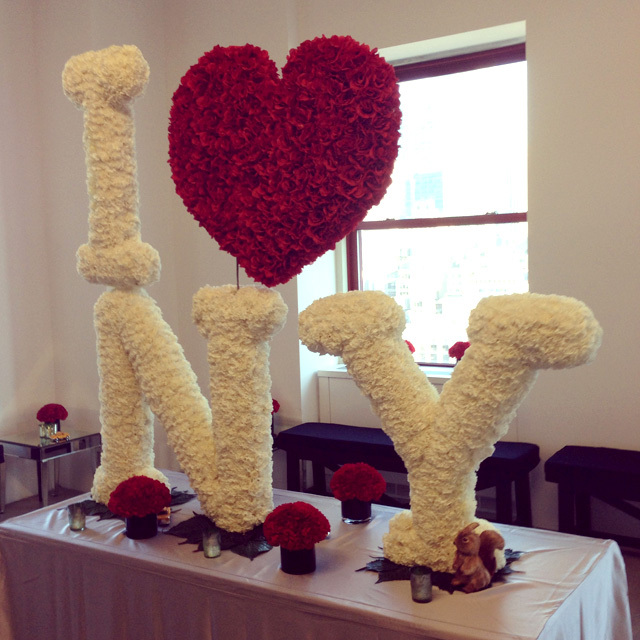 Well, to start, the Empire State Building only allows weddings at their venue 1 day a year – Valentine’s Day (good trivia knowledge for you). 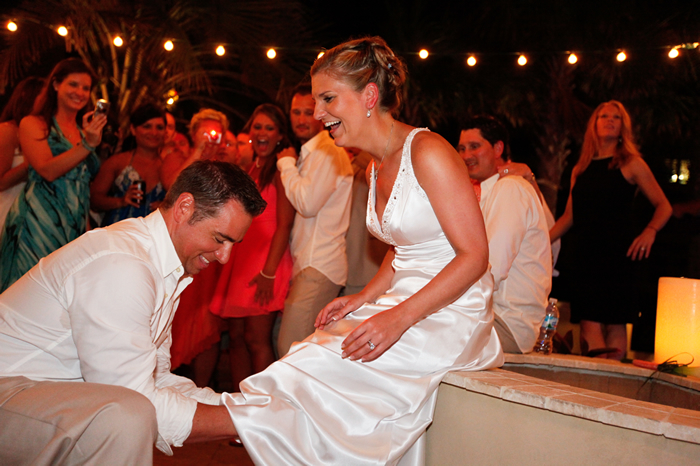 Preston Bailey decided to hold his own personal wedding there at midnight to kick off Valentine’s Day. He also held a contest where he picked 3 winning couples and designed their wedding for them. 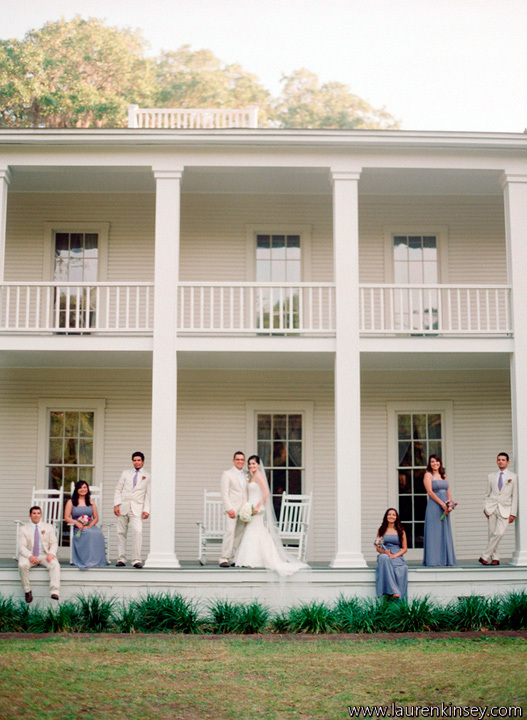 Their weddings were to happen on Valentine’s Day in the same venue where Preston had his and the winning couples could each invite up to 30 of their friends/family to attend. 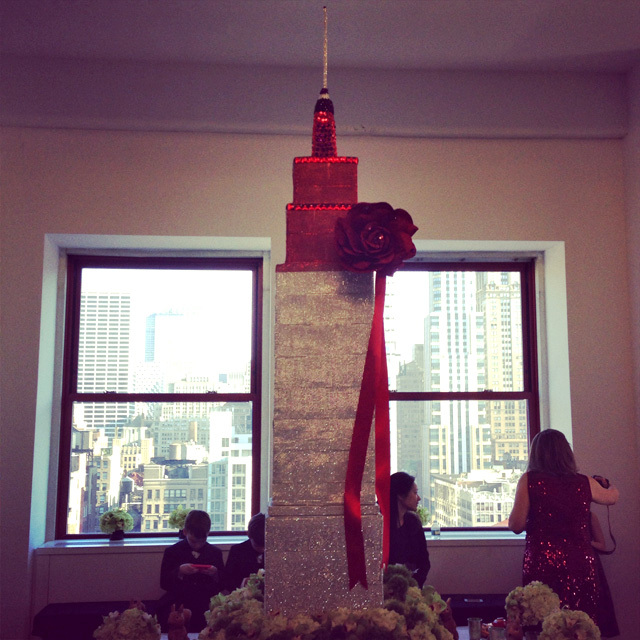 The gist of the contest was to create a 60 second video ad where you’d tell your story, why you’d want to have your wedding at the EmpireStateBuilding and what it would mean to have Preston design it. The most creative and moving stories won. This was my (and come to find out Preston’s) first time running 3 weddings simultaneously at the same venue. 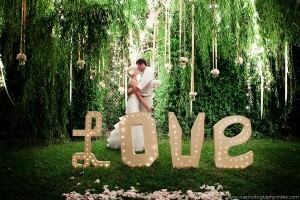 It took a ton of planning and coordination to make this come off without a hitch and to give each couple a unique, individual feel for their wedding. 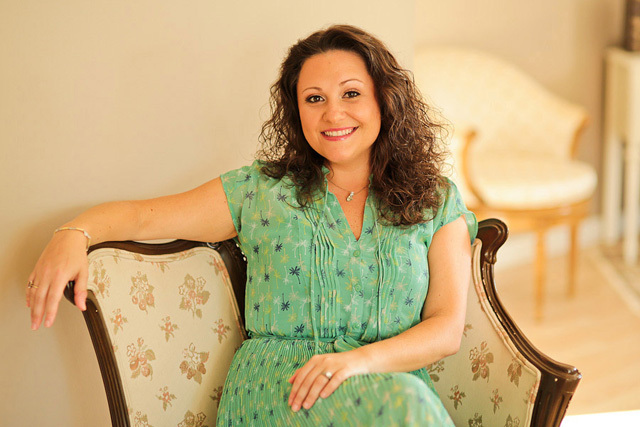 We had a few subsequent meetings with the Preston Bailey staff (all of them were incredible to work with – from Kathy Romero, Director of Weddings/Event Planning & Client Relations to Brenda Della Rosa, Director of Online Content, to Xoua Vang, CEO of the company) to come up with the game plan. 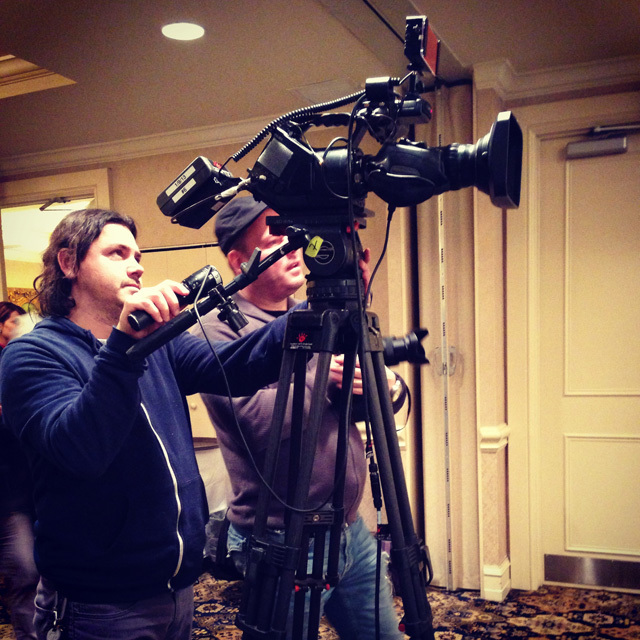 Preston has a reality show on the WE network and this was being filmed for an episode. Additionally, there were various media outlets – from local NYC News 1 channel to the AP to People Magazine – reporting on the event. 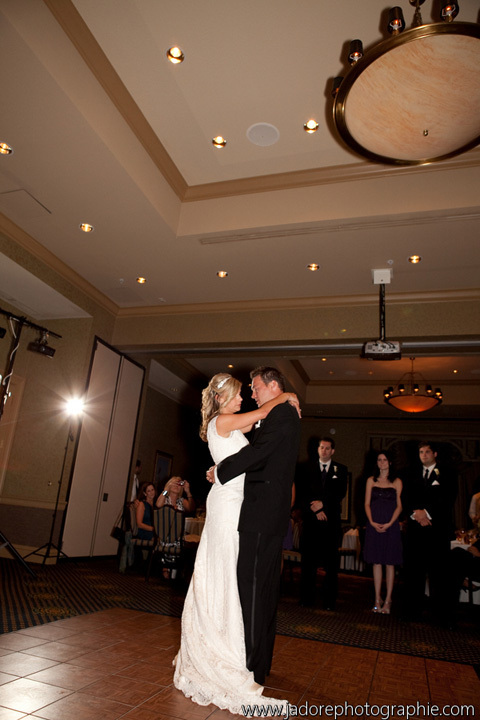 What a way to kick off the 2013 wedding season! 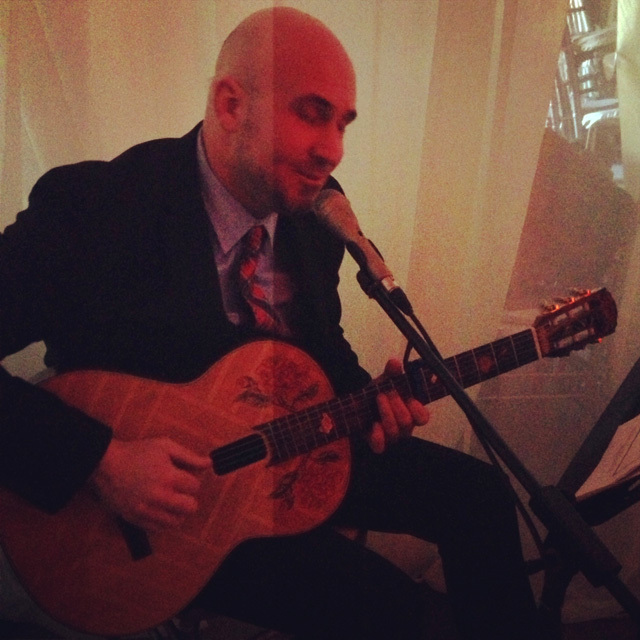 In addition to Brian B. DJ’ing the reception and providing PA support for the ceremony, we were able to showcase the latest additions to the B-Boy staff, guitarist/vocalist Matthew Cutillo and guitarist Craig Graham. Both musicians are superbly talented and the ultimate professionals. Craig played in our cocktail hour/waiting area and Matthew played for the ceremonies and lunch hour. We loaded in the day before the event. In case you don’t know, security is tight at the ESB. You can only load in at certain times during the day, must have 2 forms of ID to enter and they have a full body scanner, similar to the ones you’d find at the airport or other government buildings. 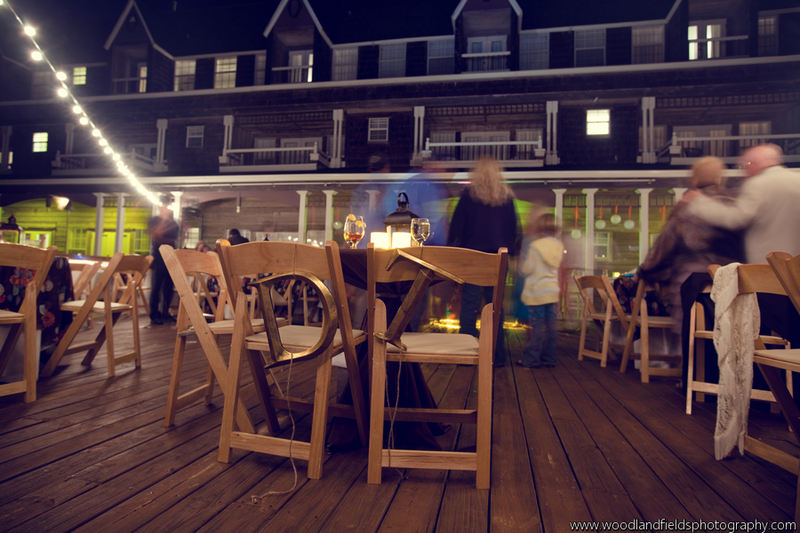 One walk around the venue and you knew this was definitely a one-of-a-kind event. 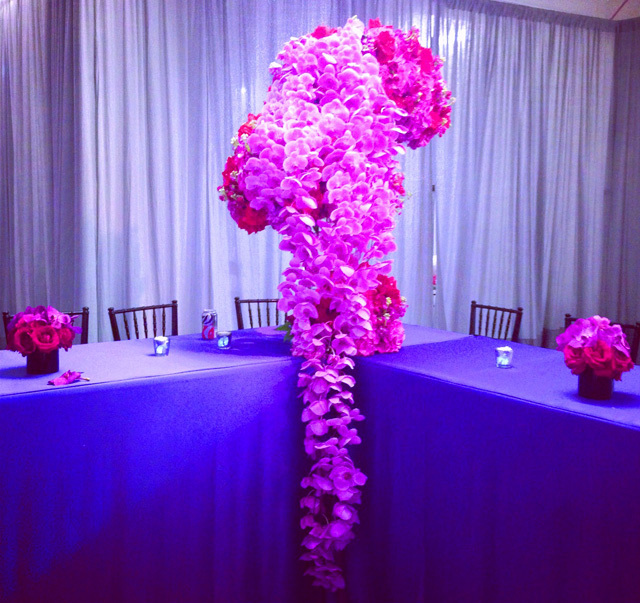 The décor was some of the most stunning I’ve ever seen and this was just on set-up day. We finished set-up in an hour or so and then headed to rehearsal (off-site at a different location). The couples were all very nice and so excited to have been chosen, which made it all the more special. Camera crews were there as well documenting the rehearsal. The next day we arrived at 7AM for a 9AM start time. All the couples and their guests were in the waiting/cocktail hour area. 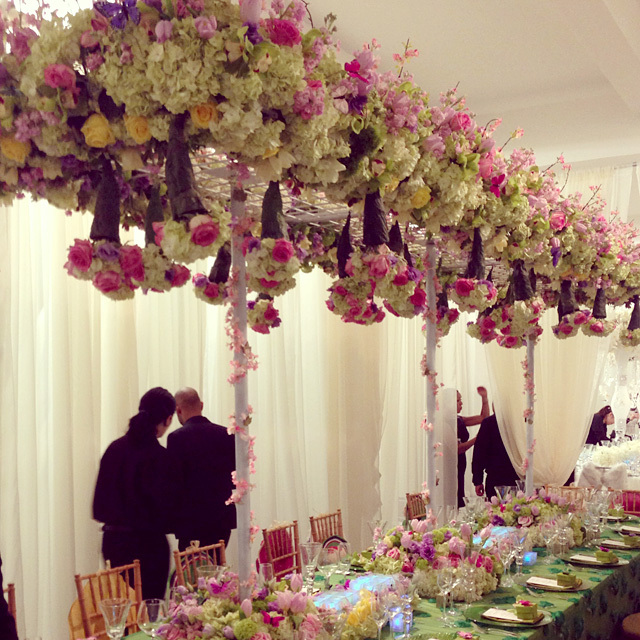 The floral décor in that room was amazing and had a window view unlike any other. 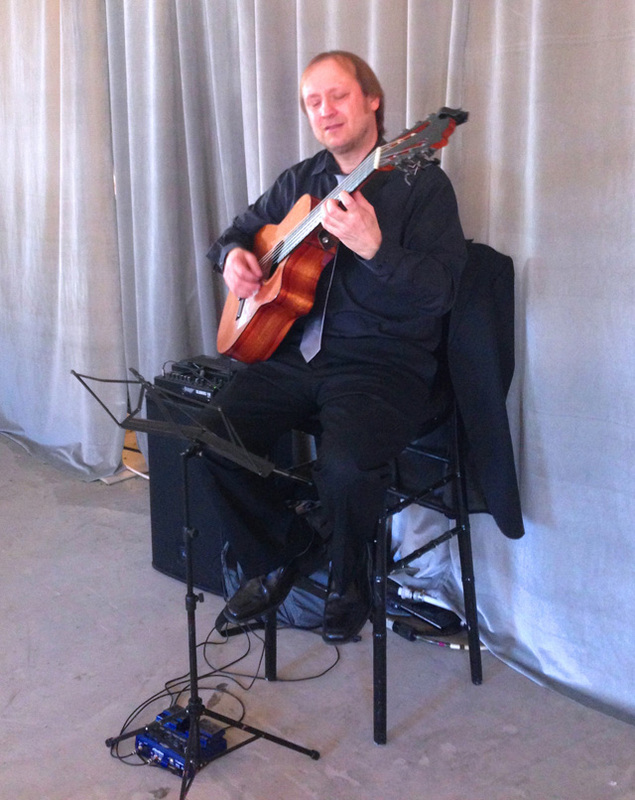 Craig provided the jazz music as they waited for their ceremonies to happen. Ceremony times were 9AM, 10AM and 11AM. Each ceremony was approximately 20 minutes. 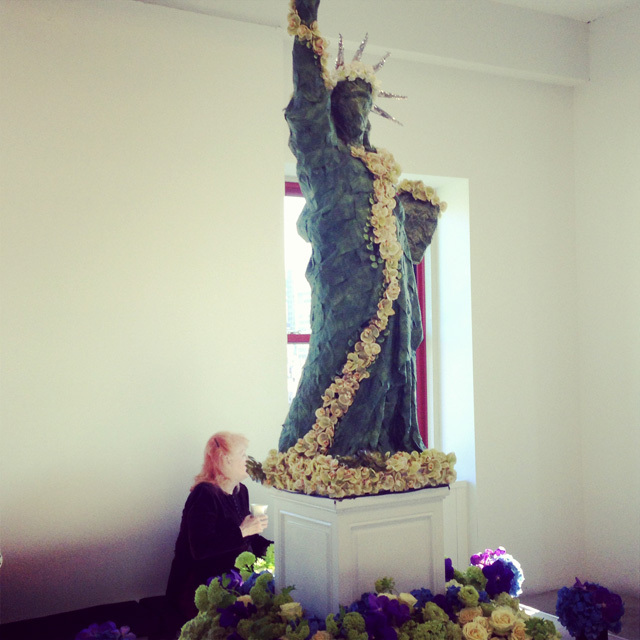 As soon as the ceremony ended, the ceremony décor was changed for the next couple. It was so impressive to see the look completely change and for it to happen so quickly. Preston decided to go with a “seasonal” feel for each wedding. One couple had a “winter” theme, another had a “spring” theme and the third couple had a “fall” theme. They all looked amazing but I was partial to the fall. 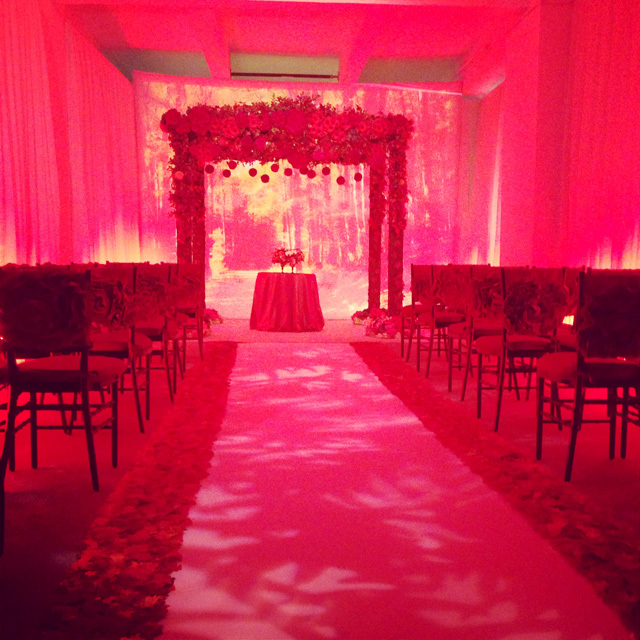 Not only is that the season when my wedding took place, but the colors were just so vibrant …especially in person. Matt absolutely killed it on vocals and guitar for the ceremonies. One of the tunes selected was “Marry Me” by Train. Have you ever tried singing a song with that high of a melody line at 9AM? Not many can pull it off. Matt did so and was just exceptional. We had nothing but compliments about his talent. 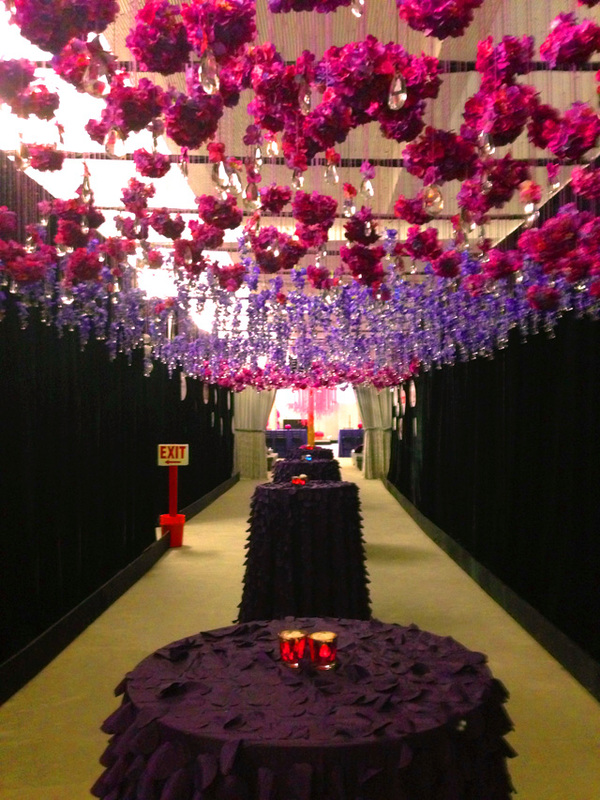 Seguing into the lunch hour, each couple had their private dining room themed to their season. 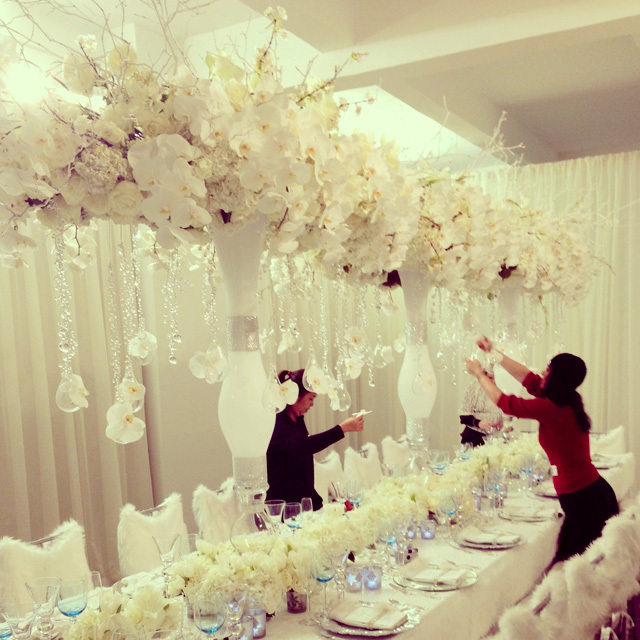 While I was partial to the “fall” season for the ceremony, the “winter” dining room was my favorite. 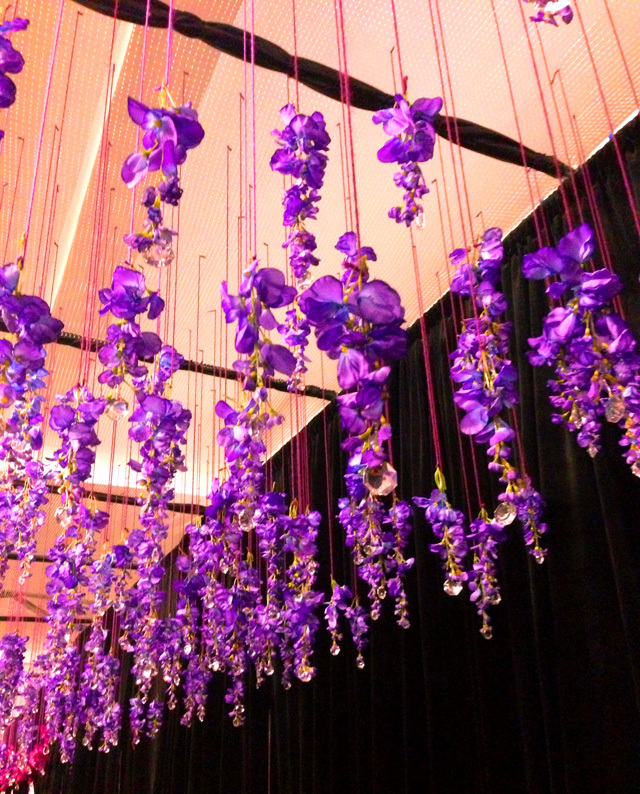 The crystals hanging from the centerpieces were stunning. 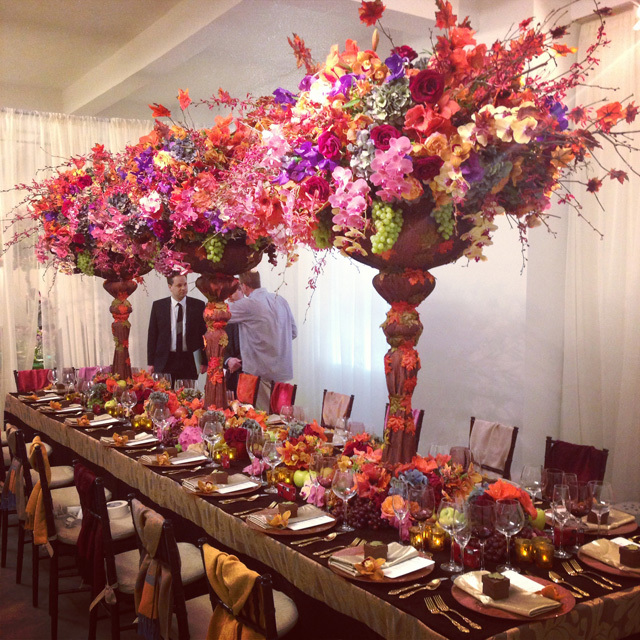 The caterer, Cardona Catering and Restaurant Consultant Group, was unbelievable. Ricardo, the chef and owner, was completely down to earth and the food was so delicious. Presentation? What can I say? It was like a 5 star restaurant experience. After lunch, we transitioned all the guests to the reception part of the space. This area was the exact same area that Preston used literally 12 hours ago. 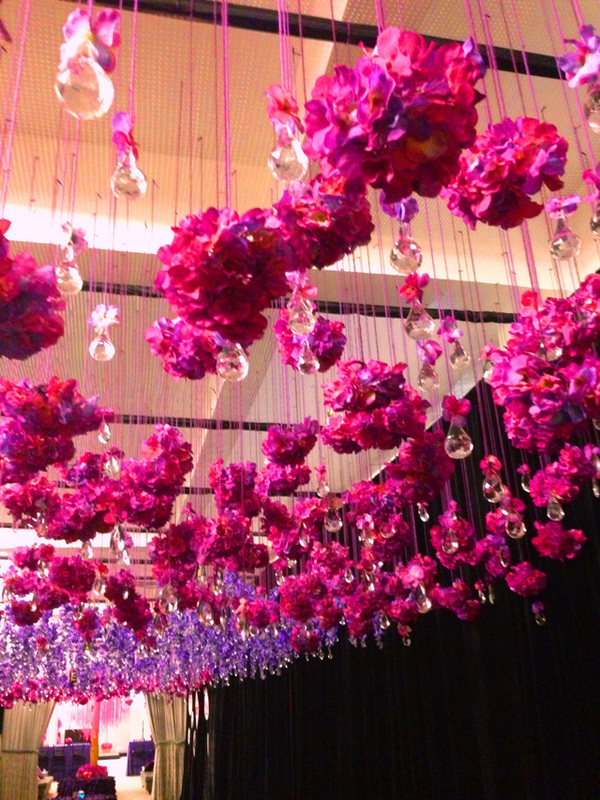 The walkway was decorated with different purple and pink florals hanging from the ceiling along with crystal. 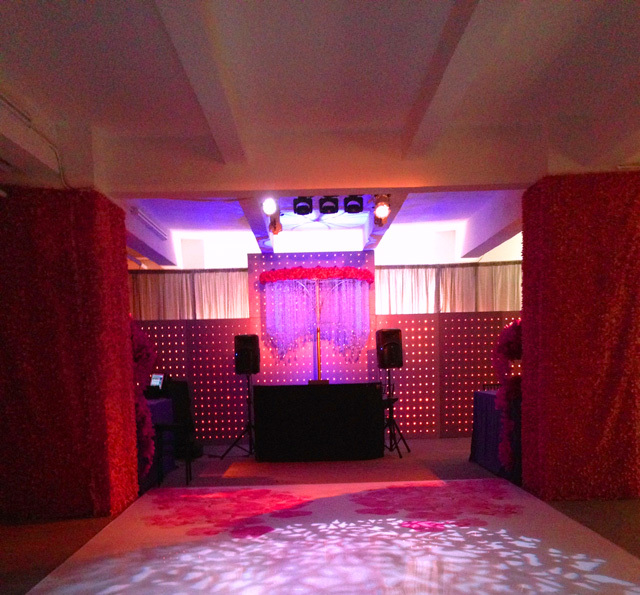 LED lights through the sheer panel drapes in the ceiling helped accent the floral choices. 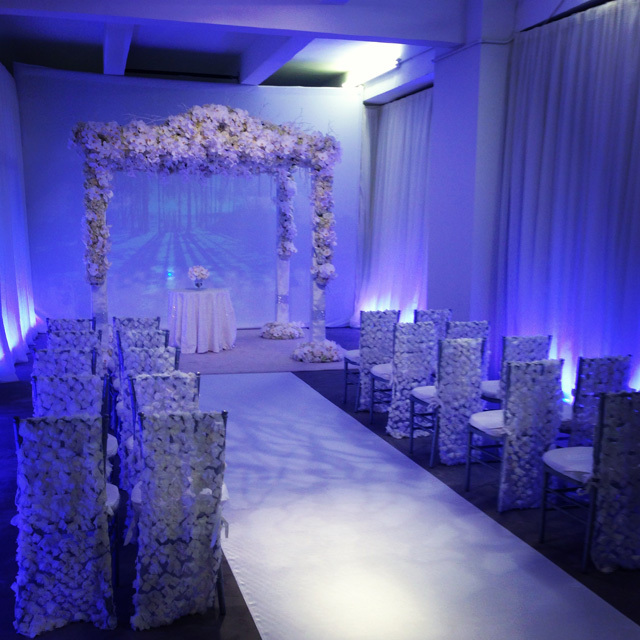 Once in the reception area, it took your breath away! 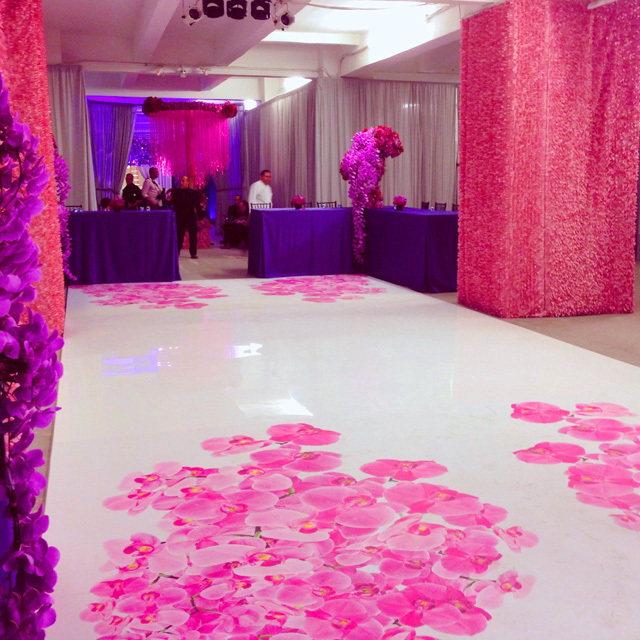 The dance floor had floral print decals and the pillars were covered with flowers from top to bottom. It was quite a challenge to give every couple exactly what they wanted, with their tastes being so varied, but at the end of the event we know we accomplished just that. The dance floor was packed from start to finish and the couples, guests and the Preston Bailey staff had nothing but complimentary things to say. The event was a total success. After what ended up being a 14-15 hour work day, my amazing wife said we could order pizza for Valentine’s Day dinner and I could make it up to her the following night. How did I get so lucky? 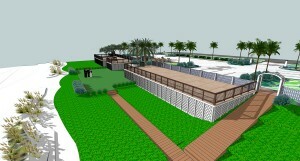 We hope to work more events with Preston Bailey and their team. We’re so thankful for the opportunity to showcase our company to them and the nation. 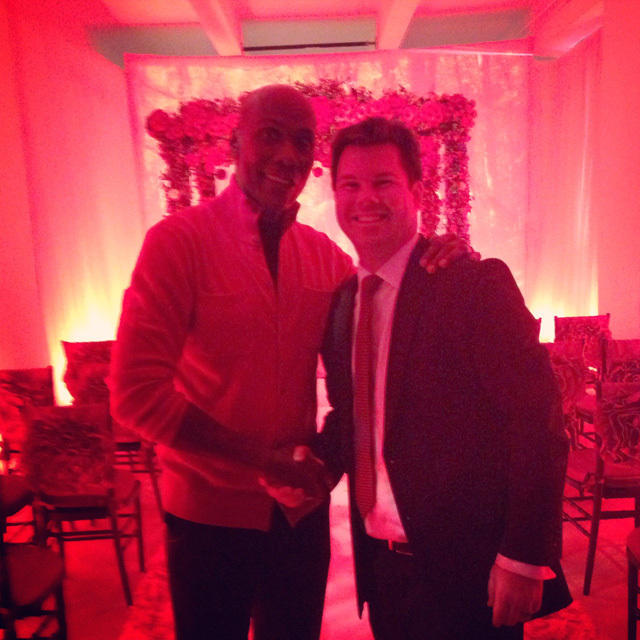 Be sure to check out the WE TV for “Preston Bailey Dream Weddings” and see the episode for yourself. January 11, 2013	by B-Boy Productions, Inc.
We hear it quite often – you guys are THE BEST! There’s a reason. We know how to rock a party. Plain and simple. Even though it’s from an iPhone camera, we wanted to give you a sample from a wedding this past year with DJ Brian B in the mix. Enjoy! December 4, 2012	by B-Boy Productions, Inc. Rarely does an entertainer have a breakout year of the magnitude that Duane Mays has had. 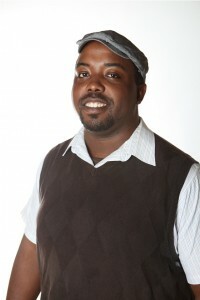 He started with B-Boy Productions, Inc. just 2 years ago. This year, however, his positive client reviews have gone through the roof and we attribute that to the hard work he’s put in. He’s now one of our most requested Florida panhandle entertainers. 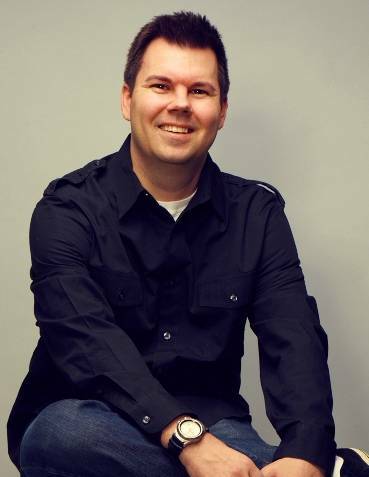 We sat down with Duane to ask him some questions on DJ’ing and specifically, DJ’ing weddings. Why did you get into DJ’ing? I really enjoy the energy of dance music and the surprise of what I like to call “forgotten gems”. I love the look on the people’s faces when nostalgia hits and a song that they used to ‘jam out” to but have since forgotten is suddenly resurrected…it’s one of my favorite things about DJing. Since I have an extensive background as a performing artist, it gives me a unique perspective in reading a crowd. I am familiar with a lot more music in different genres than the typical DJ would be. Since I primarily DJ weddings, I have a knack for picking out that perfect “old school” track to bridge the gap between the young people and the older crowd. 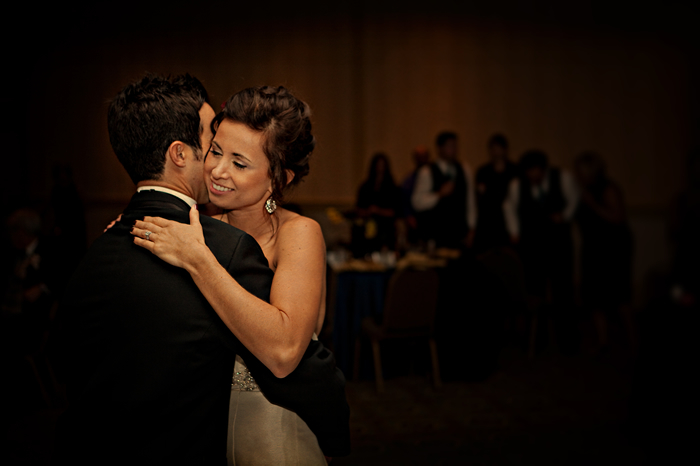 I want everyone dancing and having a good time so I focus on giving our clients and their crowd a well-balanced musical experience. Speaking of weddings, what’s your favorite part as a DJ? I love that moment at the reception where the bride and groom realize that they can relax with me at the helm. It’s like an “a ha” moment where it hits them that I’m taking all the pressure off of them and that I will be giving them an amazing party. It’s hard not to chuckle because I can’t even begin to tell you how many times a bride and groom are eating dinner at the reception, they glance over and give me that nod of satisfaction. It’s as if I’ve surpassed their expectations and usually when it happens, we haven’t even gotten to the dancing segments yet. I definitely consider working weddings a privilege and it never gets old. Any advice you’d give a bride/groom as far as entertainment is concerned? When it comes to entertainment on the big day, I’d want them to know that they can trust any DJ of B-Boy Productions, Inc. If I had a dollar for every time I’ve sat down with a bride/groom to do a planning session and the first thing out of their mouth is, “We don’t want the cheesy stuff. No Chicken Dance, YMCA, etc. 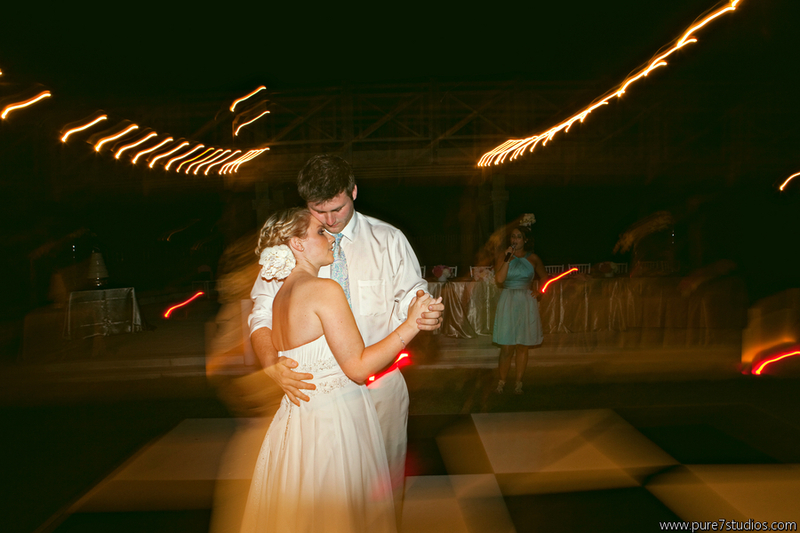 The last few weddings we’ve attended were terrible…” well, I’d be one wealthy individual. They have no clue the amount of training our company does with our entertainers. Every month we get together to enhance our craft and we look for ways to get even better! Our #1 desire is to make sure that our clients and their closest family and friends experience the best reception ever! Don’t misunderstand me…that’s not to say we don’t want a bride and groom’s input. Of course, we want to know what they want and like…that’s a big part of our success at an event. The difference is that they can be rest assured that they and their guests will be talking positively about their reception for years to come. It’s a big responsibility for us and we don’t take it lightly. 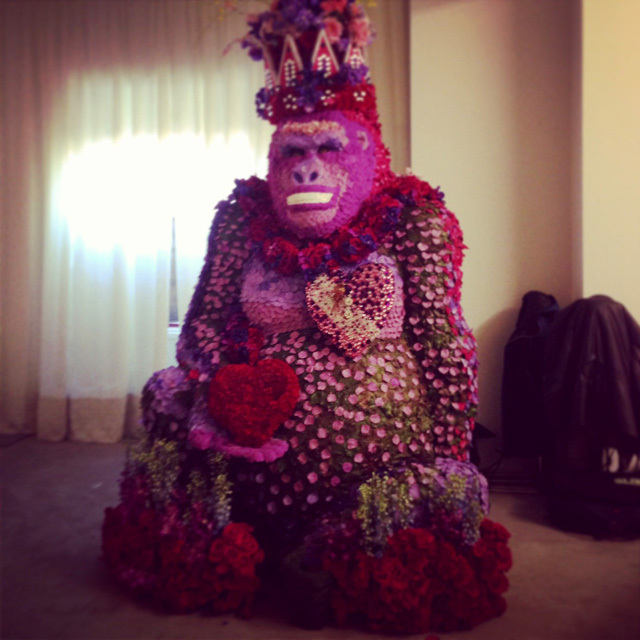 To book Duane, go to the contact page and we’ll reserve him for your wedding reception! May 7, 2012	by B-Boy Productions, Inc. Here at B-Boy Productions, we’re constantly being asked “What makes you so different?” Sit back, relax, and take a look behind the scenes at what B-Boy Productions is all about.